Fusing contemporary luxury with traditional elegance, The Colony Club enjoys an enviable location, surrounded by acres of tropical gardens and serene palm trees. 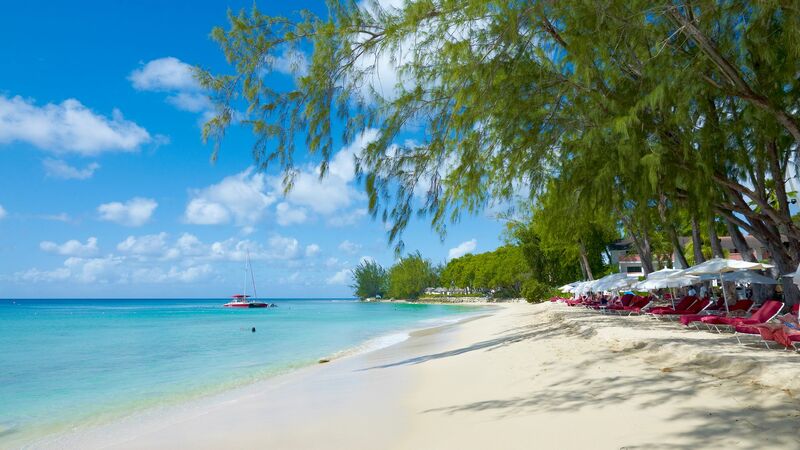 Located on the west coast of the island and complemented by the white sands of the Caribbean Sea, St. James is home to some of the most beautiful beaches in Barbados. At The Colony Club you’ll discover why St. James is famed for its high dining experiences, with a stretch of top-notch restaurants and impressive cuisine on your doorstep. Explore the Hotel’s own, The Laguna Restaurant, where you can enjoy a contemporary menu over breathtaking views of the tranquil gardens and lagoons. Those wanting to keep active will enjoy the water sports and activities, a fantastic spa and plenty of activities for children as well. Activities for children aged 3–12 years old are available during the Christmas, summer, and Easter holidays only. The resort has 96 rooms, each with its own private terrace or balcony. Hotel child prices apply to ages 2–12 years. Children under the age of 13 are not allowed during the month of February. 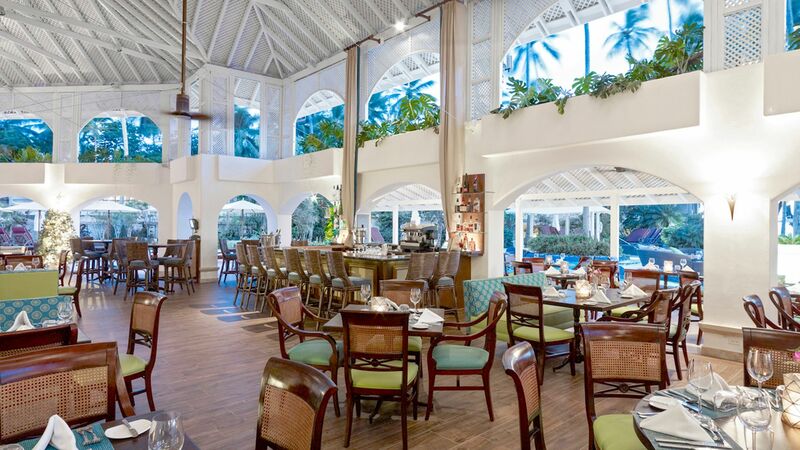 Overlooking tropical gardens and the sea beyond, you can enjoy a variety of local and international dishes, delicious seafood and carefully selected healthy options. Complemented by seasonings and herbs from the hotel’s own organic garden, choose from sushi, burgers, sandwiches and the fresh catch of the day. Laguna Restaurant also serves a complimentary full breakfast buffet daily, offering a selection of freshly baked breads and delicious pastries, a live egg cooking station and traditional cooked items. 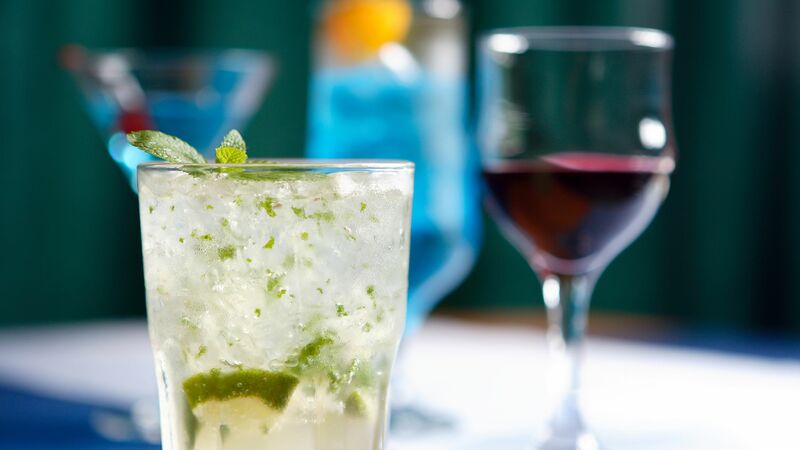 For a summery pick me up, sip on expertly made cocktails by the swim up and poolside bar. The Sunset Bar & Deck serves seafood and continental cuisine. Guests can also enjoy all day outdoor dining with weekly theme nights. For cocktails and aperitifs, head to the intimate Laguna Bar. Accompanied by live music and entertainment, it’s the perfect spot for you to unwind. The Colony Club is less than a minute away from the white sandy beach, where you will find water sports and activities, as well as loungers for those just wanting to relax. Guests can enjoy four freshwater lagoon pools, equipped with a pool concierge service, sun loungers and beautiful views of the sandy beach below. The Colony Club Hotel’s onsite spa offers a fantastic array of treatments and facilities. Guests can enjoy hot stone massages, deep tissue massages and a wide selection of other revitalising and refreshing treatments. Keep healthy and active with the hotel’s range of fitness classes, including pilates, yoga and aqua aerobics. The Colony Club offers a seasonal children’s club in a cottage in the grounds, with expert staff on hand to you’re your little ones entertained throughout the day. Certified nannies are also available day and night. Hotel guests are welcome to the many complimentary water sports, including water skiing, kayaking and windsurfing, or for something greener, St. James is home to several golf courses. The hotel can also arrange family-friendly excursions such as horse riding or a catamaran trip. Located on the west coast of the island, St James is quickly becoming a hotspot for those looking for the ultimate luxurious experience. Beautifully set with the Caribbean Sea as a backdrop, just footsteps away. 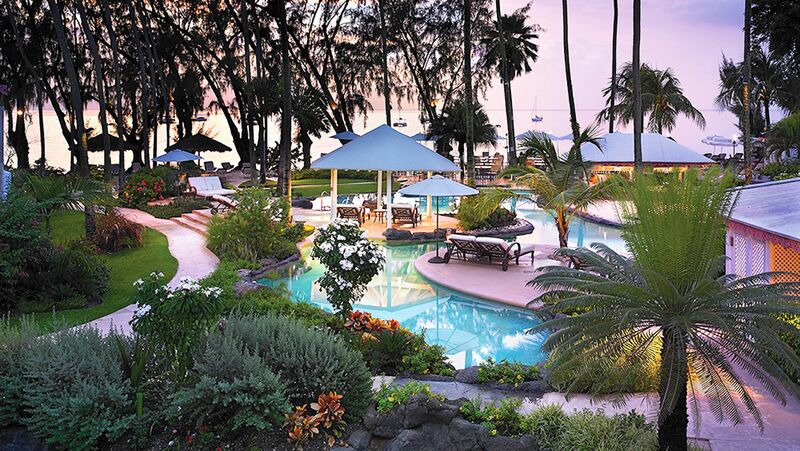 The resort is set within seven acres of gardens, surrounded by tropical palm trees and flowers for perfect tranquillity. The Colony Club is just 40 minutes from Barbados Airport. For those wanting to explore more of what the island has to offer, the Colony Club boasts a superb location and is within a short drive of the island’s capital, Bridgetown. The Limegrove Lifestyle Centre is also less than a mile away and is the ideal place for some retail therapy, with its treasure trove of high-end fashion and apparel. The Colony Club is a 40 minute drive from Barbados Airport. Pool/Garden View Rooms are stylishly decorated and have air conditioning, flat-screen satellite TV, MP3 docking station, minibar, tea & coffee making facilities, safe, iron & ironing board, bathtub, shower, hairdryer and a private patio or balcony. Luxury Poolside Rooms have a king size bed or two doubles and direct access to the lagoon pool as well as a private balcony or patio. Rooms have a Nespresso machine®, complimentary Wi-Fi and a writing desk. Luxury Swim-Up Poolside rooms feature a king size mahogany four poster bed and stylish furnishings, with access to the lazy river directly from the steps of the terrace. Ocean View Rooms have one king size bed or two doubles, marble bathroom and a private balcony with an ocean view. Facilities include a Nespresso machine® and complimentary Wi-Fi. Junior Suites with Pool/Garden View have a king-size bed (or 2 twin beds), a sitting area with a sofa bed and a spacious marble bathroom with sunken tub. Facilities include a Nespresso machine®, complimentary Wi-Fi and writing desk. Luxury Ocean View Rooms are located just steps away from the beach. Rooms have a king size bed, furnished terrace and marble bathroom. Facilities include Nespresso machine®, organic teas, complimentary Wi-Fi and a daily fruit bowl. One Bedroom Suites with Ocean View feature a bedroom with a four-poster bed and a separate living area complete with a pull-out sofa, upgraded bathroom amenities, oversized tub, Nespresso machine® and spacious balconies. Save up to 40% on the hotel price for various dates booked by 28 February 2019. “ The Rum Vault Is A Treasure! I visited the Vault with colleagues on a Tuesday evening and had the privilege of being hosted by Shane and Corey. The Vault does not typically open on Tuesday but they crafted an experience which we all thoroughly enjoyed. I have been to the Vault four times now and the food, service and rum have all been impeccable each time. Without a doubt it is one of the best experiences Barbados has to offer. Great job guys! “ What a find - can't wait to come back! The Colony Club exceeded expectations on virtually every front. Our ground floor, ocean view room was a good size and with our own little private patio it offered a quiet, shady retreat. The bed was HUGE and very, very comfortable. The food was very good with an excellent and plentiful breakfast included. We went out for lunch a few times but the all-day hotel menu was an option too. The dinner menu had a good choice and like the service in general, was always served by friendly, helpful staff. We also loved the ready availability of the water sports and cannot praise the lads there enough for their patience and help. Overall a fantastic holiday and would definitely recommend it. Tip - the buses are plentiful, cheap and the drivers (and other passengers) are very helpful so no real need to take taxis during the day. “ Better than a home from home! Second visit to Colony Club Barbados and we absolutely love the reception, location, staff, facilities and genuine warmth from every member of Staff. From early morning sunrise coffee's through to breakfast, mornings on the doorstep beach, time on the water with the brilliant water sports team to lovely lunch followed by the same again before dinners with lots of afternoon/evening entertainment from high end Cooking Demo to steel bands or special buffet evenings and the days flew by all too quickly. Children loved entertainment and water sports and would ive there if possible. Such an absolute pleasure from beginning to end. Congratulations to Management and all The Teams on all you hard work and producing such a very well run Hotel. “ Best on the island?